Prototype features: Horizontal four-strokes 500 cc. 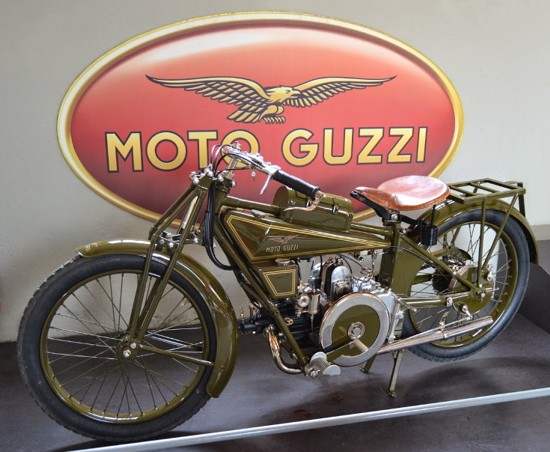 single-cyclinder engine characterized the first Moto Guzzi motorcycles, since the 1919/20 "G.P." 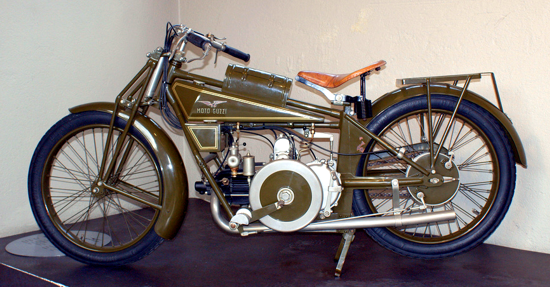 ("Guzzi-Parodi") prototype. Seeking to eliminate hand-pumped lubrication systems and exposed primary drive chains, Guzzi cast the engine in aluminium as a unit with the three-speed gearbox. Its helical-gear primary drive and considerably oversquare engine dimensions (88 x 82 mm. bore and stroke) deviated from what was normal for the period. Laying the engine horizontal in the frame aided engine cooling, which also allowed for a low-slung chassis, while the geared primary drive saw the engine rotate in the reverse direction, another unused feature at the time. To smooth out vibration and enable a more compact crankcase unit, a large (280 mm.) flywheel was mounted externally. 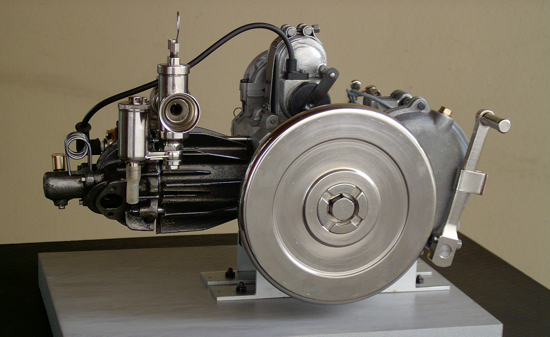 The lubrication system was exceptionally advanced, with an oil pump driven from the camshaft; this supplied oil to an external tank that was mounted in the air stream. 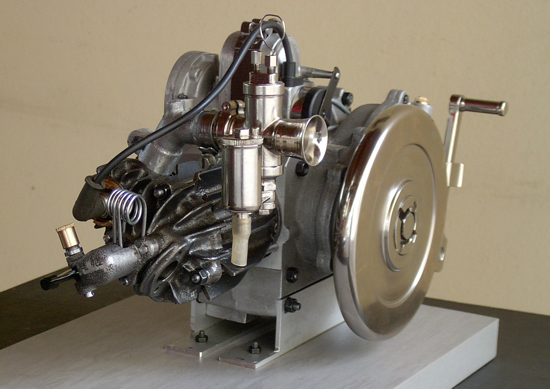 The cyclinder head design employed aeronautical engineering techniques, with four parallel overhead valves operated by an overhead camshaft and driven by a shaft and bevel gears. Compression was a modest 3.5 : 1 and, with 12 horsepower, the prototype was capable of 62 miles per hour. 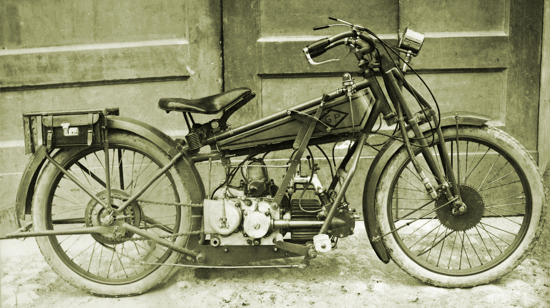 The chassis had a tubular frame with twin front downtubes, an unsprung rear bolted triangle, and a girder fork and dual springs at the front. First model features: Name: Moto Guzzi "Normale". Engine Type: four-stroke horizontal single. Bore/stroke: 88 x 82 mm. Displacement: 498.4 cc. Power: 8 HP at 3,200 RPM to 8.5 HP at 3,400 RPM. Compression ratio 4.0 : 1. Valves: Side inlet, overhead exhaust. Carburetion system: Amac 15 PSY 1 in. Gears: Hand-change 3-speed. Ignition: Bosch ZE 1 shielded magneto. Frame: Tubular duplex cradle. Front suspension: Girder fork. Rear suspension: Rigid. Wheels: 26 x 2¼. Tires: 26 x 3.00. Brakes: Expansion rear wheel. Wheelbase: 1,380 mm. Dry weight: 130 Kg. Top speed: 85 Km/h. Production: 2,065. 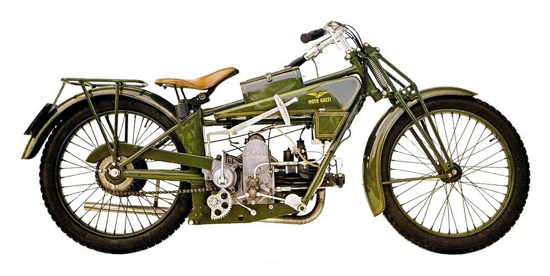 Interesting facts: The "Moto Guzzi Società Anonima" was established in Genoa, Italy, on March 15, 1921, with its headquarters in Mandello Tonzanico (now Mandello del Lario), Lecco. The three founders were: shipowner Emanuele Vittorio Parodi, his son Giorgio, and Carlo Guzzi, a former comrade in the Italian airforce. The emblem, a spread-winged eagle, was chosen in memory of their friend Giovanni Ravelli, a pilot who died on August 11, 1919 during a test flight. 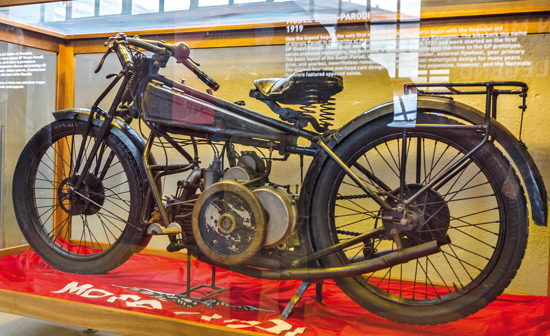 Carlo Guzzi's first horizontal four-strokes 500 cc. 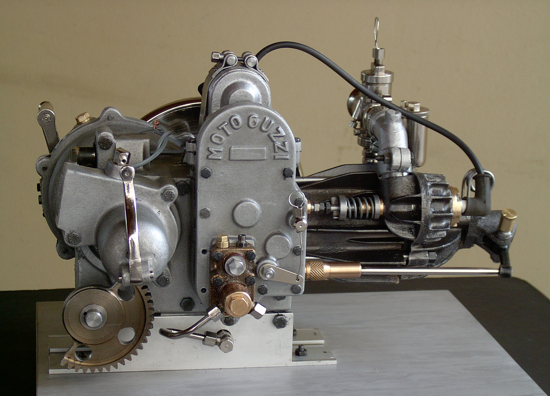 single-cyclinder engine estabilished a unique formula that immediately characterized Moto Guzzi motorcycles. The prototype, developed by Carlo and his older brother Giuseppe in 1919/20, was called the "G.P. ", for "Guzzi-Parodi". The G.P. 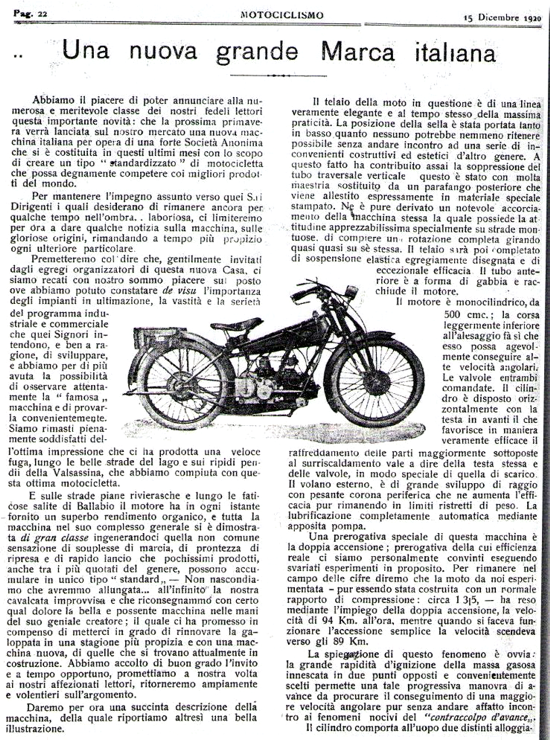 soon evolved into the production "Normale", which was announced in the December 1920 issue of "Motociclismo" magazine. The Normale appeared early the following year. While the G.P. had been a pure expression of Carlo Guzzi's engineering, economic necessity saw the Normale incorporating several updates, including the replacement of the exotic four-valve cylinder head and bevel-gear-driven overhead camshaft. With the appearance of the Normale, the company was estabilished, with the senior Parodi served as president. In addition to Carlo Guzzi and Giorgio Parodi, two other engineers were also involved: Carlo's Brother Giuseppe and Giorgio's cousin Angelo. 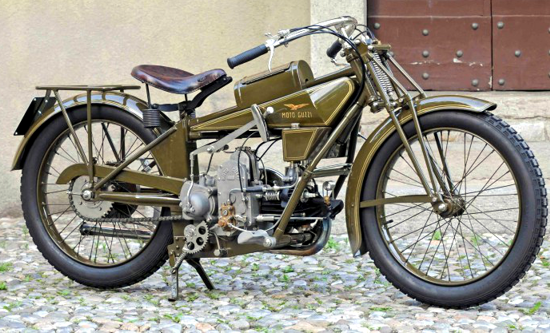 While the total production of 1921 was a modest seventeen motorcycles, it was the beginning for one of the greatest italian motorcycles marque, and also one of the longest lived. Property: Moto Guzzi S.p.A. - Piaggio & C. S.p.A.
Moto Guzzi founders. Left: Emanuele Vittorio Parodi (Genoa, ? - April 13, 1945), entrepreneur. Center: his son Giorgio Parodi (Venice, 1897 - Genoa, August 18, 1955), aviator. 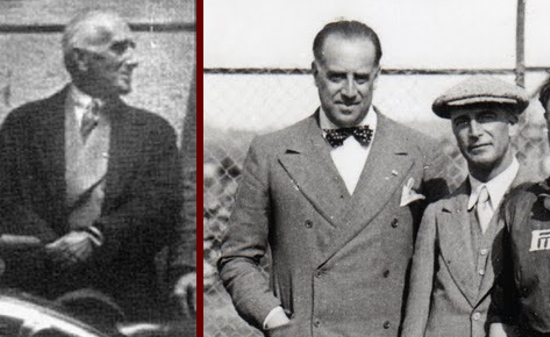 Right: Carlo Guzzi (Milan, November 4, 1889 - Davos, November 3, 1964), designer. 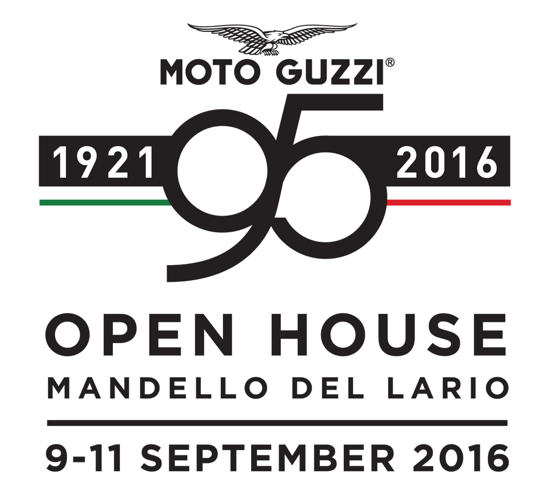 Moto Guzzi celebrate the 95th anniversary (1921-2016) with a special edition of the Moto Guzzi Open House at the historical Mandello del Lario factory, 9 to 11 September 2016.